Posh players celebrate Marcus Maddison's goal against Bury. Photo: Joe Dent/theposh.com. A battle at High Noon was approached with some trepidation given that Peterborough United have not been the sharpest of shooters in recent matches. But the early kick-off and the live TV cameras acted as inspiration for Grant McCann’s men. They shrugged off the concession of a second minute own goal to claim a deserved win - their first in nine competitive matches - through goals from classy skipper Chris Forrester, the mercurial Marcus Maddison and Bury defender Anthony Kay. Chris Forrester scores for Posh against Bury. Photo: Joe Dent/thyeposh.com. It would of course be foolish to believe all ills have been cured especially as third-placed Bury played without their two first-choice central midfielders and lost key striker Tom Pope to injury after just seven minutes, but it’s a win worth savouring for the most complete Posh performance since Millwall were despatched 5-1 at the ABAX back in August. Stringing a few wins together, particularly as Cobblers are the next opposition team in town, is key now, but don’t rule it out as Posh will gain great confidence from this 90 minutes. It was a pleasing win for all, but a most satisfying success for manager Grant McCann. He was bristling with fighting talk before the game and if he was a different, less modest character he would have rammed a few critical words down people’s throats after it. Instead he deflected all praise on to his players, nine of whom had started the dire display in defeat against MK Dons a few days earlier. Footballers as well as fans can be very fickle. McCann pulled a rabbit out of the hat selection-wise by re-introducing striker Shaquile Coulthirst to his side just six weeks after trying to get him out of the door and down the A1 to Stevenage. It takes a big man to admit an error in judgement - not necessarily in his appraisal of Coulthirst, but his faith in others to score regularly - and that wasn’t the end of the manager’s good decision-making. From the start, well after Hayden White had turned Zeli Ismail’s cross into his own after two minutes following some rank bad defending on the other side of the penalty area, it was obvious that Posh intended to dominate by mixing their length of passing up to stretch the Bury back four. White and Andrew Hughes were virtual wingers at times as Posh tried to get the ball behind Bury’s defendce to enable Tom Nichols and Coulthirst to run in behind. This in turn gave extra space to midfielders with speed, stamina and quality to spare and it all eventually worked perfectly as three goals in 15 minutes either side of half time settled the destination of the points. Forrester’s equaliser seven minutes before the break was wonderful in terms of build-up an execution. White picked the onrushing skipper out with a deep right wing cross, his touch cushioned the ball into the path of Nichols, whose instant lay-off was gleefully accepted by Forrester who finished expertly. Three minutes after the re-start the admirable Leo Da Silva Lopes won the ball in midfield, Nichols played a lovely touch pass into Gwion Edwards who offered Maddison an invitation to score that was never going to be declined. And Nichols was again involved in the final goal. He chased Da Silva Lopes’ cross while others stood and watched and his attempt to send the ball back to Coulthirst ended with Bury ‘keeper Ben Williams touching the ball onto Kay’s knee and over the line. Nichols had a hand in all three goals and clearly enjoyed having a mobile mate alongside him up front. Coulthirst should be pleased with his shift as his energy and speed proved a handful all game. Coulthirst had hit the post with a header from an Andrew Hughes cross in the first-half, just after Nichols had sent two headed attempts wide of goal. Da Silva Lopes was an immense presence alongside Forrester and almost put a few 000s on his transfer fee with an audacious dribble into the Bury penalty area that was followed by a clipped shot over the crossbar in the final moments of the first-half. There were few anxious defensive moments before Posh could celebrate victory, mostly caused by the failure to track second-half right-back Niall Maher into the area, but generally Tafazolli, Hughes, Jack Baldwin and White were first to the balls that mattered. Posh also have a more reliable goalkeeper than of late. Luke McGee had little difficult do in this game, although his kicked save of a James Vaughan shot at a time when Posh were rocking early was probably crucial for a team struggling for victories. 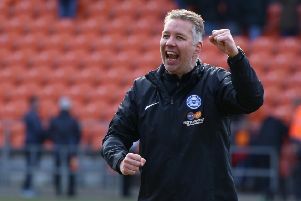 Now of course it’s time to be more optimistic and relate Posh have lost just one of their last seven League One games. Posh: Luke McGee, Hayden White, Jack Baldwin, Ryan Tafazolli, Andrew Hughes, Chris Forrester, Gwion Edwards, Leo Da Silva Lopes, Chris Forrester (sub Callum Chettle, 80 mins), Marcus Maddison (for George Moncury, 73 mins), Shaquile Coulthirst, Tom Nichols (sub Paul Taylor, 86 mins). Unused substitutes: Mark Tyler, Michael Bostwick, Nathan Oduwa, Deon Moore. Bury: Ben Williams, Greg Leigh, Anthony Kay, Kean Bryan, Niall Maher, Kelvin Etuhu, Zeli Ismail, Danny Mayor, Neil Danns (sub Tom Walker, 60 mins), James Vaughan, Tom Pope (sub Hallam Hope, 8 mins). Unused substitutes: Anthony Dudley, Scott Burgess, Paul Rachubka, Jacob Bedeau. Goals: Posh - Forrester (38 mins), Maddison (48 mins), Kay (og, 53 mins). Bury - White (og, 2 mins). Cautions: Posh - Coulthirst (foul), Da Silva Lopes (foul), White (foul). Bury - Mayor (foul), Maher (foul).